Packed on NYE during day - got a seat in the bar area and the Haddock & Chips were top dollar - there were two ales if I remember, both scottish - remember the darkish ale I had was average quality - would come back though. Surprised by the previous reviews but it has had several owners since I first popped in about 10 years ago. This is a very cosy little pub and it's often hard to find a seat. 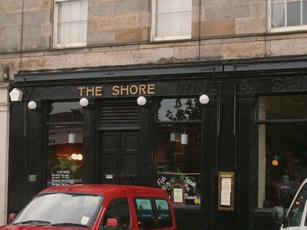 Was last there a couple of times at Xmas, very friendly service, decent selection of wine. Well worth a visit if you're down that way. Primarily a restaurant with a bar/bistro area. The tables are a bit close together for comfort and they are clearly trying to cram in as many tables as they can. Small bar with a few stools. Good service. Deuchars and Abbot on air dispense. There is a large mirror at one end of the bar that makes it look bigger than it is, until you see yourself walking towards you.